Looks are deceiving: if you came across with this shrine, you’d never guess what’s inside of it. 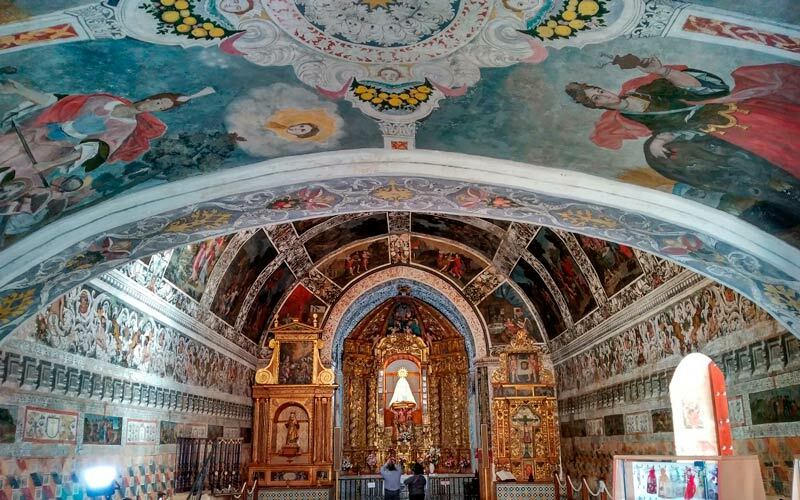 A treasure lies in this modest building lost in a Badajoz town: it is known as the Sistine Chapel of Extremadura. Olive trees and streams surround the Shrine of Virgen del Ara in Fuente del Arco. For a chapel in the middle of nowhere, it’s surprisingly big; however, you’d never guess there is such a gem behind its white walls! 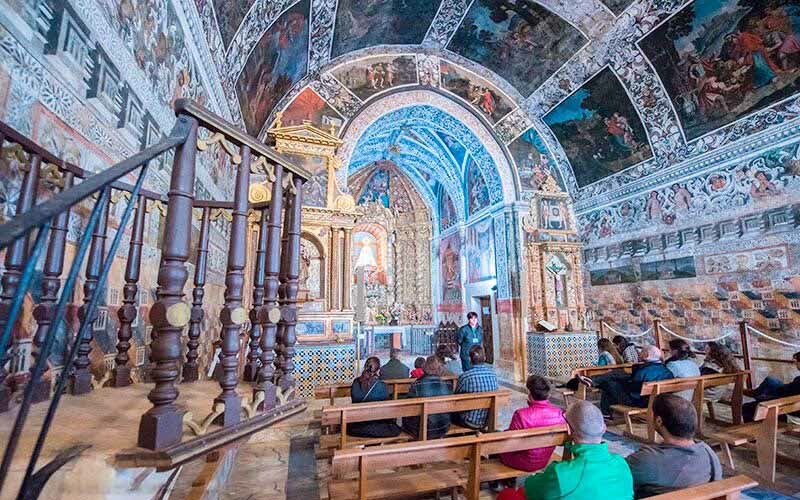 Once we enter the Sistine Chapel of Extremadura, the first thing we see is a wide nave with a concave roof decorated with Old Testament scenes. There are 26 paintings that represent The Book of Genesis. Even though they’re numbered, they’re not in chronological order; that’s why each one is accompanied by a small description. 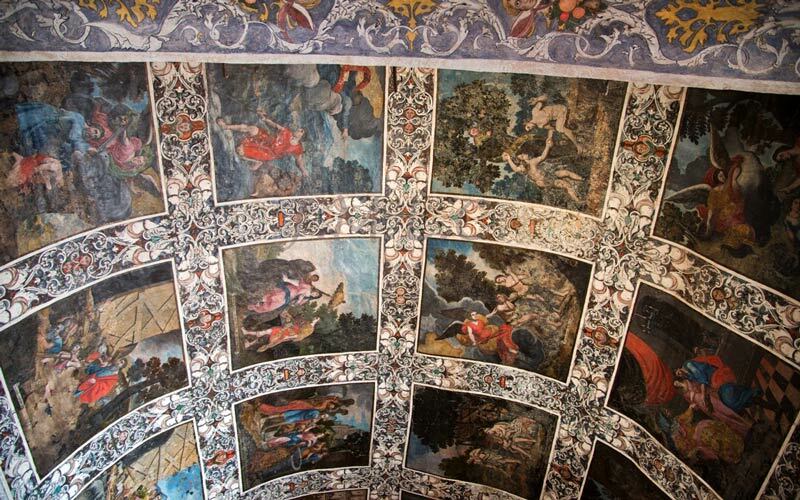 Colours invade each and every corner of the Sistine Chapel of Extremadura. The authors of the paintings are unknown: they date back to the 17th century, but other parts of the shrine, as the plinth with fresco painting, date from the 14th century. On the exterior there are still remains of Roman columns, specifically at the Mudejar style horsheoe-arched entrance. There’s a legend linked to the creation of this spectacular shrine in the middle of the countryside. 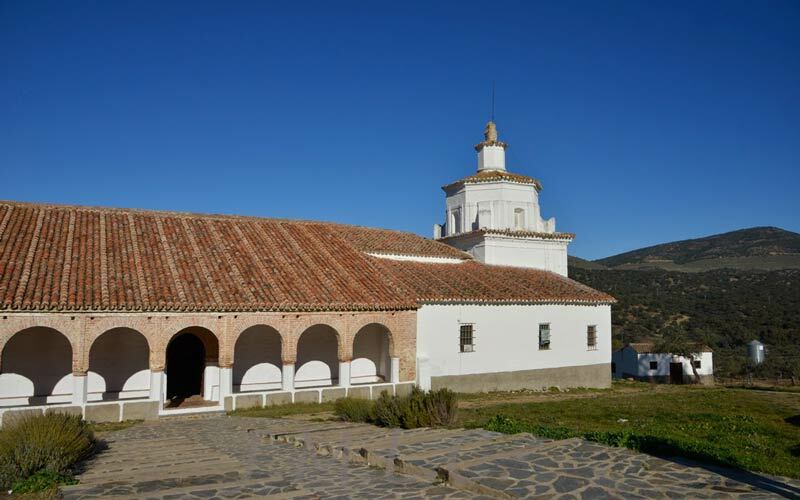 According to this story, this was the place where the Virgin Mary showed herself to a Moorish princess called Erminda, who asked the Virgin to cure his blind father. She assured her that he’d have his vision back if they converted to Christianity. Once he was able to see again, they started to build the shrine to celebrate the miracle. The Shrine of Nuestra Señora del Ara is open to the public from Tuesday to Sunday from 10 am to 3 pm. Guided tours are also offered at 11 am, 12:30 pm and 2:15 pm. Having a guide by your side will make the experience richer, as he/she will have a torch with him/her to show you the paintings and to give you a detailed explanation of each of them. 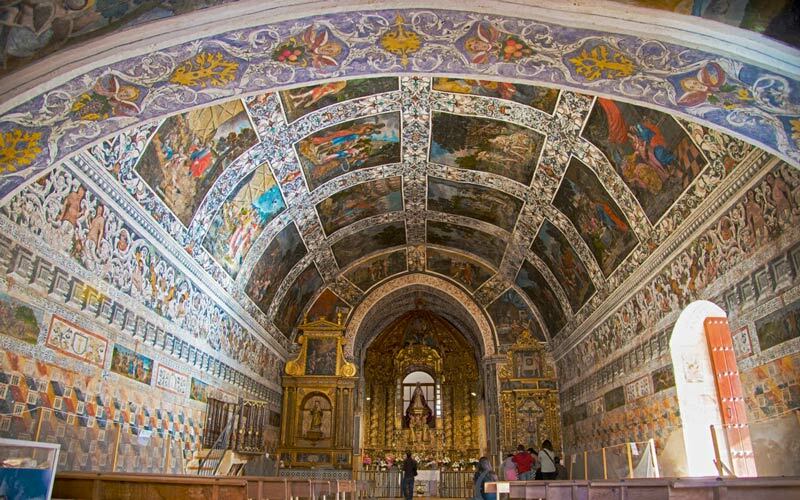 The Sistine Chapel of Extremadura shouldn’t be jealous of the Roman one in the slightest, as it is a real gem! Would you visit it?